Back in the summer I took part in the Beach Reads Blog Tour run by Rosie Amber and listed out the 5 books I would take on holiday with me. 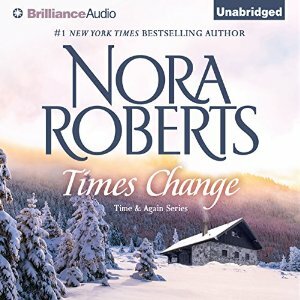 As my audio book I chose Time Was: Time and Again Book 1 by Nora Roberts (see the post as to why) but when I went to download it was not available at the time due to quality issues I believe so I chose the second book instead and here is my review. I rarely listen to audio books, I don’t seem to be able to fit them successfully into my life at the moment but I should do it more often as there’s something very soothing about being read to. Luke Daniels does an excellent job and it was a recommendation to listen to him that led me to this book in the first place. His voices of each character were spot on and consistent throughout. Jacob Hornblower goes back in time to find his brother, Caleb, who in Time Was – Time and Again Book 1 fell in love with Libby Stone. Finding the cabin that he believes Caleb is living in he meets Sunny Stone, Libby’s sister, who is staying there instead as Caleb and Libby have gone away for a while. He has also misjudged the weather and lands in the middle of winter ending up snowed in at the cabin with Sunny. Both these characters are strong-willed. Jacob is focused on his work and on taking his brother back home with him. Sunny doesn’t know what she wants to do with her life and neither is looking for any kind of love interest. I found Jacob endearing as he tried to fathom out the 20th Century, remembering things he’d learned in history where he came from and all the while keeping his time-travelling secret from Sunny which was always going to be a problem. I was thoroughly entertained by this story and look forward to going on a long journey to get to listen to it again. I drove across the US once with all the slots in my car’s 7-disk player filled with Nora audiobooks. She probably saved my life and those of many an innocent fellow driver. Oooh I love a road-trip Barb – you can only go so far in this country and I really fancy a trip across the US that would last days. I would load up a waffle of audiobooks (I’ve assumed that is the proper name for a group of AB’s!) and it would be bliss! Well thank you for the recommendation Cathy 🙂 Luke was excellent!